El País ( listen ; literally The Country) is the highest-circulation daily newspaper in Spain and one of three Madrid dailies considered to be national newspapers of record for Spain (along with El Mundo and ABC). 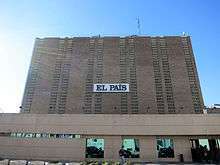 El País, based in Madrid, is owned by the Spanish media conglomerate PRISA. ↑ Keila Guimarães (26 November 2013). "El País lança edição digital no Brasil". ↑ "Spain: Media and publishing". Encyclopædia Britannica. Retrieved 29 May 2015. 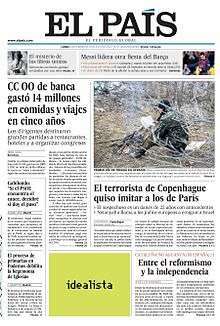 ↑ "El Pais - Corporativo". El Pais. ↑ Richard Gunther; Jose Ramon Montero; Jose Ignacio Wert (2000). "The media and politics in Spain". In Richard Gunther; Anthony Mughan. Democracy and the Media: A Comparative Perspective. Cambridge University Press. Retrieved 27 November 2014. ↑ Alan Albarran (10 September 2009). Handbook of Spanish Language Media. Routledge. p. 20. ISBN 978-1-135-85430-0. Retrieved 29 October 2014. ↑ "Bis'El País' Co-founder Mendo Dead at 77". Editor & Publisher. 25 August 2010. Retrieved 16 September 2010. ↑ Francisco J. Pérez‐Latre; Alfonso Sánchez‐Tabernero (2003). "Leadership, an essential requirement for effecting change in media companies: An analysis of the Spanish market". International Journal on Media Management. 5 (3). doi:10.1080/14241270309390035. Retrieved 24 April 2015. ↑ Nuria Almiron; Ana I. Segovia (2012). "Financialization, Economic Crisis, and Corporate Strategies in Top Media Companies: The Case of Grupo Prisa". International Journal of Communication. 6: 2894–2917. Retrieved 9 July 2013. 1 2 3 Katrin Voltmer (2006). Mass Media and Political Communication in New Democracies. Psychology Press. p. 19. ISBN 978-0-415-33779-3. Retrieved 28 November 2014. 1 2 Frank R. Baumgartner; Laura Chaqués Bonafont (2014). "All News is Bad News: Newspaper Coverage of Political Parties in Spain" (PDF). Political Communication. Retrieved 4 December 2014. ↑ Four freedoms awards Archived 25 March 2015 at the Wayback Machine. Roosevelt Institute. Retrieved 21 April 2015. ↑ Rosario de Mateo (1989). "The evaolution of the newspaper industry in Spain, 1939-87" (PDF). European Journal of Communication. 4. Retrieved 17 April 2015. ↑ For which role El País was awarded the Prince of Asturias Prize for Communication and the Humanities in 1973 Archived 13 May 2008 at the Wayback Machine. ↑ «Prisa y PSOE se apoyan mutuamente para seguir en el poder: dinero y publicidad a mantas». Artículo de Por Andalucía Libre mencionando declaraciones de El Mundo 7 February 2007. Archived 31 March 2010 at the Wayback Machine. ↑ Jagdeep S. Chhokar; Felix C. Brodbeck; Robert J. House (17 June 2013). Culture and Leadership Across the World: The GLOBE Book of In-Depth Studies of 25 Societies. Routledge. p. 644. ISBN 978-1-135-70380-6. Retrieved 31 January 2015. ↑ "World's Best-Designed winners (2006)". Society for News Design. Retrieved 6 October 2013. ↑ Andrea Czepek; Melanie Hellwig; Eva Nowak (2009). Press Freedom and Pluralism in Europe: Concepts and Conditions. Intellect Books. p. 279. ISBN 978-1-84150-243-4. Retrieved 12 December 2014. 1 2 Anne Penketh; Philip Oltermann; Stephen Burgen (12 June 2014). "European newspapers search for ways to survive digital revolution". The Guardian. Paris, Berlin, Barcelona. Retrieved 7 January 2015. ↑ Catarina Alencastro; Paulo Celso Pereira (18 June 2016). "Temer suspende patrocínio de R$ 11 milhões para blogs políticos". O Globo. Archived from the original on 22 June 2016. Retrieved 6 September 2016. ↑ "El Pais to launch new men's magazine Icon". Publicitas. 19 July 2013. Retrieved 19 August 2015. ↑ "¿Ha cambiado o no El País de ideología? :: Periodismo :: Prensa :: Periodista Digital". periodistadigital.com. Retrieved 20 November 2015. ↑ "Rajoy sobre Cataluña: "Tendré que explicar mejor mis razones" | España | EL PAÍS". politica.elpais.com. Retrieved 20 November 2015. ↑ "Morocco bans Spanish paper over royal cartoon". Doha Center for Media Freedom. 19 February 2012. Retrieved 8 October 2014. ↑ "Spanish Paper El País Makes a Fool of Itself | venezuelanalysis.com". venezuelanalysis.com. Retrieved 20 November 2015. ↑ "Venezuela to take legal actions against El Pais | AVN". avn.info.ve. Retrieved 20 November 2015.